These are about 1" across. 2 PCS cufflinks. Silver color can match with all kinds shirts. We will try our best to reduce the risk of the custom duties. Rare Vintage Peruvian Aztec Sterling Silver Cuff Links. These cufflinks have a nice look to them .they have swival backs, they are 3/4” wide. The condion is good, they need to be cleaned, please see photos and ask questions. These pieces are of beautiful quality and are sure to impress all who lay eyes on them. Material: Copper. Stone: Crystal. Color: Gold. Give us a chance to make things right for you, and we will do our best to give you the best possible solution. Condition :100% brand new Material:Brass&Resin Color:Silver&Black Weight(Kg):0.033 Made with highest quality metal setting for the everlasting shine. Would make a perfect gift for Birthdays/Anniversaries/Fathers Day/Businessman/Bridegroom Brand Unbranded Metal Brass Metal Purity Unknown Color Silver&Black Main Stone No Stone UPC Does not apply MPN Does not apply. 20 Pairs(40pcs) New Silk Knot Cufflinks. You will receive 20 pairs in 20 different colors. Quantity: 12 pieces=4 pieces tie clip 4 pairs (8 pieces) cufflinks 1pc Gift Box. Silver Cufflinks: 19 14 3 mm (Cut Stripes), 16 16 3 mm(Square). Golden Cufflinks: 19 11 mm (Smooth), 17 10 mm (Cut Stripes);. New ListingVintage STERLING SILVER Mid-Century Rooster Men's Cufflinks - 17.5 GRAMS, L@@K! They are hallmarked925 & jeweler tested as sterling silver. ->60 BRONKAID FROM THE MANHATTANS REAL & ORIGINAL FREE SAME DAY SHIPPNG!! The cuff link is marked GUATE 900, also partial mark ALPACA. 2 X BRONKAID 60. Expiration various but none expired. (Gift And Jewels® BEAUTIFUL STERLING (.925) SILVER TURQUOISE 7.1 GRAMS CUFF LINKS ). BEAUTIFUL STERLING (.925) SILVER TURQUOISE 7.1 GRAMS CUFF LINKS. 6134 Flamingo Rd. Gift And Jewels. This unique design is sure to make you feel comfortable as well as stand from the crowd and add you style. If you need a durable yet elegant cufflink, this is for you! Quantity:1 Pair. Official Presidential seal with Donald Trump's signature in raised relief on back. This is a two cufflink set. These are not cheap, poorly made cufflinks. These are a high quality and will last for years or decades. 14 Kt Gold Filled And Goldstone Oblong Rectangle Cufflinks. The stamping has a /20 before 14 kt G.F. The color of the goldstone is more vibrant and rich than pictures show. Genuine Natural Black Onyx Gemstone - 3 Pieces. Solid Sterling Silver.marked as shown in photos with the 925 Silver content hallmark and a maker symbol hallmark. 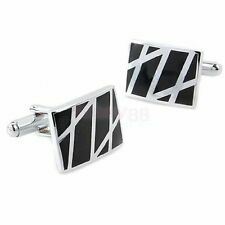 Stunning black and silver vintage geometric cufflinks. Hallmarked .800; sterling silver is .925, so they are very close to sterling. Excellent condition. Very handsome. No buyers outside continental United States, please. Estate: Rare Reed & Barton Bengal Tiger Damascene Round Cuff Links, Signed Reed & Barton Damascene and comes in their Original Case. They need a cleaning & polishing. Are normal surface dings & scratches. Back of one cufflink shows more discoloration than the other. The hinged original Reed & Barton case shows wear and is old & has surface dirt from being in storage for decades. Shipped USPS First Class Package with tracking. No returns accepted. Will five a combined shipping discount. Bright silver tone airplanes fly above brushed gold tone square cuff links and a small silver tone matching plane decorates a tie tack. Very fine condition. I received these in the box and don't know if they have been worn or not. Base clip: 55mm x 5mm. They are also magnetic. Great condition, and have only been worn once. Handmade artisan design of the highest quality. Item colors may vary slightly due to settings on various computer monitors, such as resolution, color quality, contrast or brightness settings. Weight:10.5 grams. 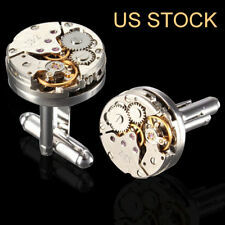 Men's Shirt Glass Lovely Expressions Bronze Brass Copper Cufflinks Cuff Links. Men's Party Shirt Glass Superman S Mark Silver Brass Copper Cufflinks Cuff Links. 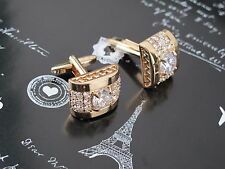 Classic design, French cufflinks, Gold Plated, Yellow Crystal, Cubic Zirconia AAA Clarity. The size of the Cufflinks is 18mm 18mm. The Cufflink is also suitable as a gift for friends and family, such as Boyfriend, Fiance, Husband and Father. Men's Party Shirt Glass Star Wars Mark Bronze Brass Copper Cufflinks Cuff Links. Vintage Hickok Texas TX Cuff Links 1960's. Condition is Pre-owned. Shipped with USPS First Class Package. Star Cuff Shirt Cufflinks. Cufflinks,Ties And Suits. Silver Tone. Overall Polished Finish Look. Rolex Rose Gold Crown Cufflinks. Cufflinks,Ties And Suits. and an overall polished shirt finish look. Free Cufflink Gift Box. New ListingVINTAGE GOLD TONE 3-D CUFFLINKS & TIE CLIP ROADSTER 1" INCH CAPRI SET. They have never been used box has a little wear from being in the drawer. Condition is Pre-owned. Color: Silver. Material: Glass. We will be happy to resolve any issues you may have in a cordial and friendly manner. All products are quality checked. Otherwise deal is final. 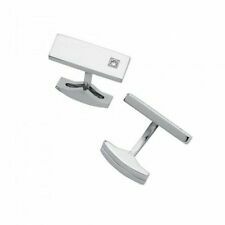 Condition :100% brand new Material:Metal Weight(Kg):0.07(Tie Clip);0.013(Cufflinks) Made with highest quality solid surgical metal setting for the everlasting shine. Would make a perfect gift for Birthdays/Anniversaries/Fathers Day/Businessman/Bridegroom Brand Unbranded Metal Alloy Metal Purity Unknown Main Color Gold Main Stone No Stone UPC Does not apply MPN Does not apply. Cufflinks are small pieces of jewelry designed to fasten shirtsleeves. These formal alternatives to buttons are commonly used with shirts that have French cuffs, which do not come with standard enclosures. They come in a wide variety of styles and shapes, and are a welcome addition to any formal look. What's the right way to wear a pair of cufflinks? Find the Right Shirt: Start by wearing a shirt with French or Double cuffs as they naturally allow for easy insertion of these accessories. Fold the Cuffs: Fold them back, so that the sleeves end in a straight line. Align the Holes: Before inserting one of the pair of cufflinks, hold the edges of the shirtsleeves parallel; they should lay flat together. The cufflink holes should line up perfectly. Insert: Place the cufflink in the hole, and secure it so that the embellished side of the jewelry is facing outwards. 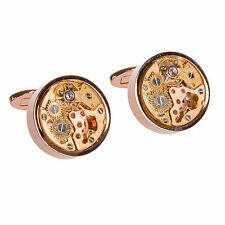 What pieces make up a pair of cufflinks? 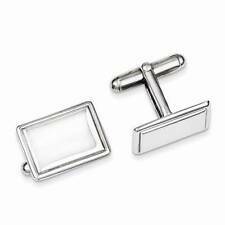 Insert Member: The insert member, or large head, of the cufflink is the decorative front face of these accessories. These heads are attached to a post, which is inserted through the shirt's button holes. Hinged Toggle: The toggle is the fastener. It swings out from the post and latches shut to ensure that the cufflinks stay put. What materials are pairs of cufflinks usually made of? What are common styles of cufflinks? Bullet Back: Bullet back cufflinks are easy to secure. Wearers simply flip the bullet so that it lines up with post, and then flip it back again to secure it in the right position. Whale Back: These combine a flat head with a straight post and a type of enclosure known as a "whale tail," which flips flat against the post. 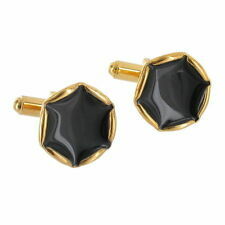 Stud: Instead of having hinges, these pairs of cufflinks consist of a head and an interior backing. This variety is durable and secure, as well. Chain Link: These consist of two heads that are joined together with a metal chain. Both heads are decorative, and the chain provides a looser type of enclosure. Knot: These are similar to chain link varieties, but the heads are shaped like knots, and they're connected via a fabric cord. Locking Dual Action: Instead of a traditional post, this style uses a watch-like closure mechanism to attach the heads to the holes. Fabric: For a more casual aesthetic, fabric cufflinks have a button-style head made from fabric.